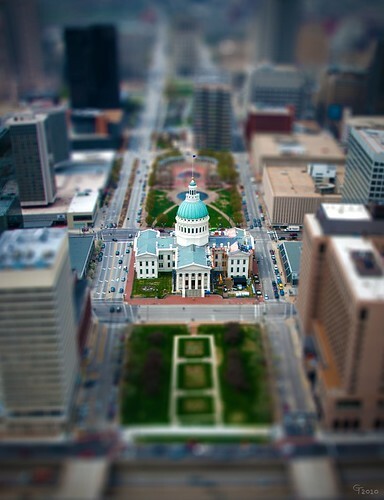 St. Louis Courthouse Miniature, originally uploaded by Thomas Gehrke. Playing with more shots from St. Louis. Originally 2 shots (foreground and background), I merged them into one longer shot. This seemed perfectly suited for a tilt-shift take. Rather than simply doing a gradient lens blur, I took some time to create a depth map in an attempt to get something a bit more realistic looking. I am not entirely happy with the results, but do feel as though I am homing in on a reasonable technique. About a week ago, after a very long day at work, I came home and just wanted to relax, eat, hang out and maybe do a little "work" on the computer. Unfortunately I received an email from a book author who had found out that the eBook publisher he was planning on using seemed to have a thing for "borrowing" artwork to be used as cover art. He had decided to match as many book covers to artists as possible and tracked me down in order to let me know that a painting of mine was being used on a book currently being sold on Amazon.com. I made some adjustments to the XSLT. If you've had problems getting this to work previously, you might want to try it again. My SharePoint Workflow History Is History! The other day I had a customer get in touch with me who is using a SharePoint document library with a basic, out-of-the-box approval workflow. The problem that they were having was that the approval status column was not displaying anything where previously it had displayed "Approved" with a handy link to the Workflow Status page. A page that shows a reasonably formatted Workflow History that they were using as proof for auditing purposes. I'm not going to get into the discussion regarding whether or not this is appropriate or whether SharePoint auditing is the right answer. If you are interesting in a snapshot of that discussion, it has been pretty well covered here. The reality is that we make these tools available to our customers and they use them (if we're lucky). I needed to figure out what was happening and what our options for resolving things for them were.